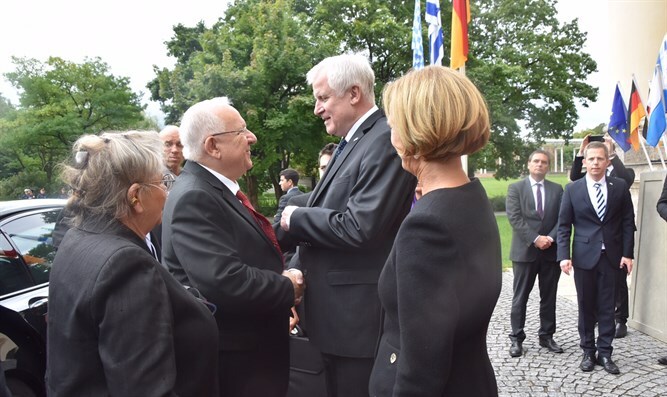 President Rivlin meets with Bavaria Minister-President Seehofer ahead of Munich Memorial inauguration. President Reuven Rivlin on Wednesday morning met with Bavarian Minister-President Horst Seehofer. Rivlin left for Germany on Tuesday, to honor a memorial for the victims of 1972's Olympic games massacre. At the games terrorists killed 12 people, including 11 Israeli athletes and coaches, and one German policeman. Rivlin noted the warm friendship between the countries, Bavaria's commitment to its relationship with the State of Israel. He also noted the importance of the establishment of a memorial to the Israeli athletes murdered at the 1972 Olympics. Seehofer also complimented Israel's foreign services on their foreign representatives to Germany over the years, and in particular to the Consulate in Bavaria. According to Seehofer, the Israeli Consulate in Bavaria is "an inseparable part of the community life there." Over the years, the leadership in Bavaria had been careful to show no tolerance to any kind of racism, especially anti-Semitism. While Rivlin and Seehofer spoke, First Lady Nechama Rivlin met with the Minister-President’s wife, Mrs. Karin Seehofer. Together, the two women met with Israel Prize Laureate for Sport Esther Roth-Shahamorov, who was part of the Israeli delegation in 1972.